Rajnath Singh several projects in the Union Territory of Dadra Nagar Haveli. These projects will boost the infrastructure of Dadra Nagar Haveli and will help in increase of tourism and industrial sector. After inaugurating several projects, Minister Rajnath Singh highlighted the natural advantages of beauty and greenery of Dadra-Nagar Haveli. Airports Authority of India (AAI) has appointed its first woman firefighter, Taniya Sanyal. Taniya is currently undergoing training in Delhi and will be appointed for AAI’s eastern region airports. Considered a profession only for men, AAI till recently did not have recruitment norms for women firefighters. AAI is facing a shortage of firefighters due to expansion & new airports coming up. Latest International Current Affairs April 22 Updates from around the globe. Iraq resumes payments of Gulf War reparations. Iraq has resumed paying Kuwait compensation for the destruction of Kuwaiti oil fields and facilities during the 1990-91 Gulf War with the disbursal of $90 million. The payment had been suspended since October 2014 because of security and budgetary problems that the Iraqi government faced in its fight against Islamic State. Iraq still has to pay a remaining amount of nearly $4.5 billion. India, Finland settle Nokia tax row. India and Finland have reached an accord on the tax dispute with Nokia under the Mutual Agreement Procedure. The resolution covering the disputes pertaining to Nokia India as well as Nokia Corp brings to an end one of the biggest tax disputes involving multinational companies. This paves the way for the sale of Nokia’s Chennai plant, which has been shuttered since November 2014. Check out the latest trending business Current Affairs April 22 updates by reading the news. 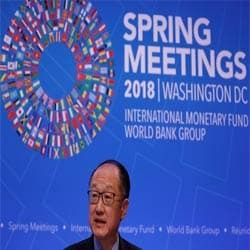 World Bank approved $13bn increase in capital. World Bank Group has endorsed a package of measures that include a $13 billion increase in paid-in capital. The package approved by Development Committee of Board of Governors consists of $7.5bn paid-in capital for IBRD & $5.5bn paid-in capital for IFC. World Bank Group will now be able to support drivers of long-term sustainable growth, including investments in human capital & resilience. ICICI Bank has introduced a ‘digital form’ which will help open current accounts in a few hours in comparison to an industry average of a few days. Bank officials would now be able to capture information about customer & business digitally & verify KYC documents in real-time. Digital forms are expected to help bank secure more clients & help increase bank’s market share. Fugitive Economic Offenders Ordinance 2018. Cabinet has approved promulgation of an ordinance that will empower govt to attach properties both within the country & overseas of fugitive economic offenders. It seeks to confiscate properties of economic offenders like Nirav Modi who have left the country to avoid facing criminal prosecution. Current Affairs April 22 is bringing you with Records, titles and other updates from the world of sports. Barcelona won fourth Copa del Rey in a row. Barcelona became the first team in 85 years to win four straight Copa del Rey titles after defeating Sevilla 5-0 in the final. 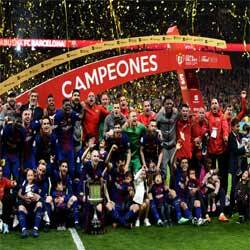 Luis Suarez scored twice, and Lionel Messi, Andres Iniesta, and Philippe Coutinho also made the scoresheet for Barcelona’s record-extending 30th Copa triumph. No other team had won four Copa titles in a row since Athletic Bilbao from 1930-33. He also played the banker goblin Griphook in 2001′s “Harry Potter and the Sorcerer’s Stone” and appeared on dozens of TV shows. Troyer was born in 1969 with achondroplasia, a genetic condition that kept him less than 3 feet tall. Candidates hoping to get Government Jobs can get more details about the Current updates from above links. You can read some latest Current Affairs, and attempt Current Affairs Quiz which helps you to crack various Competitive Exams. Make use of our Current Affairs April 22 and current affairs India 2018 for better scoring in exams. Users will be benefited with the free month wise Current Affairs PDF and Updates available for download. The Free Quizzes & GK Questions available in this Affairs Section will benefit all the career hopefuls to get their desired Sarkari Naukri. This current affairs daily page is well created by the dedicated team members of recruitment.guru. Make use of Current Affairs April 22.